The media scoffed at and mocked the few accurate polls during the entire general election: LA Times Daily Tracking Poll, Rasmussen, and IBD. Why? For the sole reason that they were showing a close election. All of the other polls were oversampling democrats by up to 10, 12, 15 points. This means that regardless of the raw numbers of republicans, democrats, or independents surveyed, the pollsters would recalculate the numbers in order to reflect a democratic voter turnout advantage by over 15% in some cases. This is because the turnout models these pollsters were forcing their raw data to conform with were based on the 2008 and 2012 elections. Now did anyone (except Hillary Clinton) really think that democratic voters would turn out for Hillary like they did for Obama in 2008 and 2012? Did the media/ pollsters really think republican and independent enthusiasm level for Trump was at Mitt Romney levels? If you recall, Mitt Romney is the candidate conservatives refused to vote for even though the economy was terrible and his opponent was Barack Obama. A.) The Republican Party had dramatically reduced the Democrats’ voter registration advantage since 2012. B.) Democratic voters were utterly unenthusiastic for Hillary Clinton. C.) Republicans and independents (and even some democrats) showed high enthusiasm for Trump. But instead of adjusting the turnout model to more realistic expectations, resulting in closer polls, the media deliberately chose to stick with the delusional models leading voters to believe Hillary was well ahead. This tactic worked well for them in the past. The trick they use is to show the democrat well ahead and inevitable, which in turn demoralizes the republican’s base and thus suppresses his vote. Thus, the media is used to using their polls as a self-fulfilling prophecy. Except this time, it didn’t work. Trump supporters were committed to voting for him as people who spend six hours attending his rallies are not going to mind standing in poll lines for much shorter periods of time to actually vote. As it turns out the rallies actually did mean something, although the media dismissed his crowds out of hand. On the flip side, respondents who said they would vote for Hillary decided she was so inevitable, why bother. Thus, the strategy backfired. Plus, Trump supporters were being warned by sites such as this telling them the truth about the polls. The elite left lives in its own virtual reality bubble. This bubble exists inside the DC Beltway, inside swanky Manhattan cocktail parties, inside Hollywood & the music industry, inside the newsrooms of CNN, ABC, NBC & CBS, inside the New York Times and the Washington Post, inside the pretentious voices at NPR, and among all of the intelligentsia in the most privileged universities across the country. Since the elites perceive most voters to be knuckle dragging mouth breathers, they view any serious intellectual engagement or dialogue with such types as both distasteful and a waste of time. Thus, the best way to “persuade” such unsavory plebeians is for the elites to use their vaunted superior intellects in order to trick them into voting in their own best interest. Of course, these plebeians are too stupid to know what is really in their best interest, so they must be lead there unawares. The elites then trick their own voters, who they see as dimwitted rubes, by getting them riled up about fake crises, one after the other, that evil republicans are causing and that only the elites’ hand picked democrats can fix. These crises are to their voters what cat toys are to cats. It keeps them excited, distracted, and so focused on neutralizing the source of their frustration, they don’t notice they are being manipulated. Thus, these elites, through their media industrial complex and institutions of higher learning, are constantly trying to convince a large portion of the democratic base that there is racism, sexism, bigotry, and homophobia lurking around every corner in this country just waiting to oppress them. If you were to tune in to any one of these propaganda outfits on any given day, you would almost think you are living in the era of cross burnings and lynchings or in a Middle Eastern dictatorship where women have no rights and homosexuals are executed. Of course, these things aren’t happening here, but the elites try hard to convince their voters (who they see as useful idiots) that the seeds are already planted and that these horrors are only a few republican politicians away. The elites imply that people like Donald Trump and Mike Pence don’t SAY they want blacks lynched, want women as property, or want homosexuals killed or they could never win. So instead the elites assure their voters that republican candidates use “dog whistles” to signal to their own racist, sexist, homophobic voters that this is what they really want to accomplish. These “dog whistles” can be anything from them saying “All Lives Matter” (racist), to being “Pro-Life” (sexist), or to supporting “religious freedom” (homophobic). Thus, if republicans use any of these words, the elites tell us we can be assured of what they “really” mean. After all, Trump’s slogan “Make America Great Again” is obviously meant to “dog whistle” “Make America White Again.” What further proof do we need? After over a year of constant propaganda being pumped out by their media that Trump is a walking, talking Adolf Hitler, the leftist elites finally thought that they had demonized him in the mind of enough voters to the point that he was unelectable. This is the same playbook the leftist elites use in every election. In 2012 their media even howled with a straight face that the pusillanimous Mitt Romney was somehow waging a “war on women.” Mitt Romney was waging a war on women…let that sink in. And their fearmongering was so effective, a lot of the democratic base bought it. What the leftist elites did not count on in 2016 was the diminished influence of their TV and print media empire due to the growing awareness of the American people that they are being duped. A great number of Americans, thanks to Wiki Leaks, Project Veritas, etc., started to see that the media and the Democratic party had always been one and the same group of left wing elites; fixing elections, feeding debate questions to their anointed candidate, working in tandem to create useful narratives, conspiring to take down republicans, conspiring to avoid covering certain news, etc. After seeing the DNC’s internal e-mails exposed, a lot of Americans also realized the leftist elites were a bunch of hypocrites. They realized that these elites cried “racist” and “sexist” constantly against anyone they wished to silence, yet in their personal conversations and lives, they were the ones who were often the most racist and sexist. The leftist elites had gone to the well once too often. The true America that swing state voters experienced was far different from the concoction of the leftist elites they saw on TV and read about in their papers. In real America, outside of the leftist bubble, people in this country have been hurting with no job for eight years while the leftist elites helped cook the books and make it look like the unemployment numbers were reasonable. In real America, citizens were not experiencing rampant racism, sexism, & bigotry, but they were experiencing rising health insurance premiums and higher taxes. In real America, citizens would have been held accountable for breaking the law, but they saw Hillary Clinton openly flaunting it in the left’s virtual America with no repercussions. In real America, voters saw their tax dollars and jobs going to people who were in their country illegally. In real America, citizens saw their neighbors or friends injured, raped, and murdered by illegal aliens who should have long since been deported. In real America, Americans saw that racial tensions had only escalated under the current President. When citizens of real America in these swing states came out en massse to vote for Trump on election day, the leftist elites were shocked. Not because they finally realized America rejected their false reality. No. 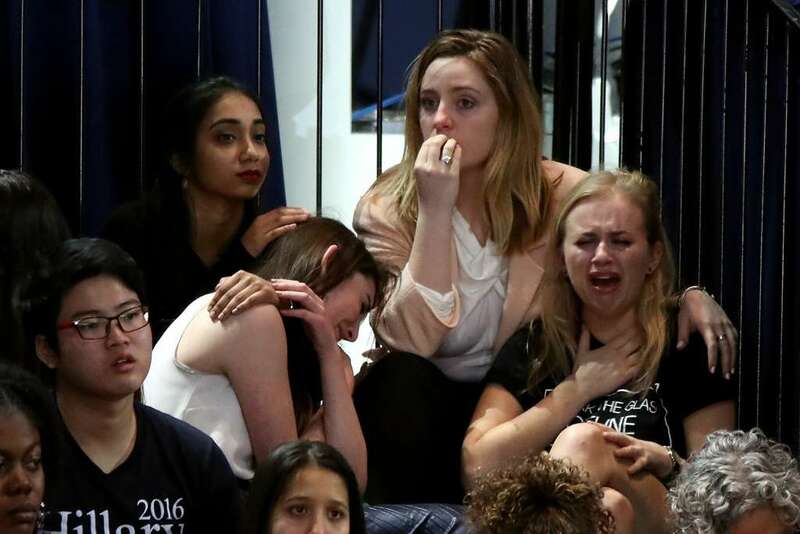 The leftist elites were only shocked by the fact that the tactics of “persuasion” they used on their own voters did not work this time when they fully expected them to be enough to win. Thus, the leftist elites’ resentment and contempt towards their own voters will only grow. For by letting Trump win, the democratic voters have proven in the eyes of the elites, just how stupid and untrustworthy they really are. Since this only reinforces the leftist elite’s belief that these people can’t be reasoned with, the solution in the minds of the elites is simple. Their voters must be made to feel even more frightened and horrified about what they just allowed to happen in order to teach them a lesson so that it will never happen again. This has already been proven true. Every day we see the media’s hysterical proclamations that every one of Trump’s cabinet appointments is a racist. This is fully what they intend to do for the next four years: incite hysteria. Sadly, the rank and file democratic voters, the same voters so taken for granted and condescended upon by the liberal elites, were not only shocked but horrified because they actually believed and still believe the media’s scare tactics. For example, many of these poor folks actually do believe that the country just voted for a racist, sexist, bigoted, ableist, homophobic misogynist Hitler who will now begin to oppress each and every one of them. This is, of course, a hyped up propaganda lie the leftist elite media has been selling for a year and a half, but in these folks’ minds it is true and terrifying. For every single source they get their news from (funded and/or run by leftist elites) tells them so. Our message to these voters? Please stop living in fear. Donald Trump is not the racist misogynistic devil your overlords told you he is. They use these issues as distractions. They don’t actually believe any of it. They simply want to retain their power, status, prestige, and their easy way of life. Their ideas you learn in the universities, their “critical theories” and “crises” are all propaganda they use to keep you living in fear and anxiety so you are easier to manipulate. All they want from you are your votes. Yet you have continually voted for the hand picked candidates of the liberal elites and none of these apparent crises they told you exist ever gets any better. Instead they only get worse because the leftist elites will always need these crises to in order to motivate you out of fear to do what they want. They want their career politicians in power and their mouthpieces in the news media gainfully employed. So please search for the truth and break yourselves free of their false reality bubble. Read the sources they told you were racist, sexist, bigoted, and homophobic and decide for yourselves. Talk to conservative people and see whether they want to oppress and persecute you. Challenge the authority of the liberal elites and see if they remain loyal to you. Try to disagree with them and see if you yourself are not called racist, sexist, and bigoted. If you do this you will find the truth. And only the truth will set you free. Simply put the best Man won God bless Trump. Your support of Hillary Clinton was support of abortion till birth and support of the killing of innocent babies. No Catholic could ever vote for such horror. Until such time as you realize your beliefs are not in line with the Catholic Church, repent, and go to Confession, you are not to receive Communion at a Catholic Church. Back in 2004, I was in a program to return to the Catholic Church. One day, I was listening to Catholic radio and Karl Keating and some woman were talking about some guy in Detroit who was “leaving some wriggle room to vote for John Kerry”. That was the end of my journey. Why should I elect republicans who’s only interest seemsto be enriching themselves and impoverishing me. She (and you) KNEW Bush was going to destroy the lives of working class Americans. That is all that republicans ever do when given power. You notice abortion is still leagal. There is no Marriage amendment to the Constitution. The only thing you seem to be able to accomplish, is my ruin. Enjoy Canada. I hope you love sky high taxes, waiting lines for medical care, abortion on demand, and persecution of Catholics.